Today we are pleased to announce general availability of Performance Insights. Already available since October 2017 as an open preview with Amazon Aurora with PostgreSQL compatibility, Performance Insights makes it easy to view the load on an Amazon RDS database. Using Performance Insights, you can more easily identify bottlenecks and discover what to do when performance problems arise. You can find a demo video on YouTube. Since the open preview release, when Performance Insights only offered one day of history, customers have been asking for longer performance data retention. That one day has now been extended to a seven-day free tier. With seven days of history, you can analyze a wide variety of issues, including those that arise over a weekend or that are not discovered for a few days. With the seven-day free tier, you have plenty of time to troubleshoot issues and share performance information with other team members. 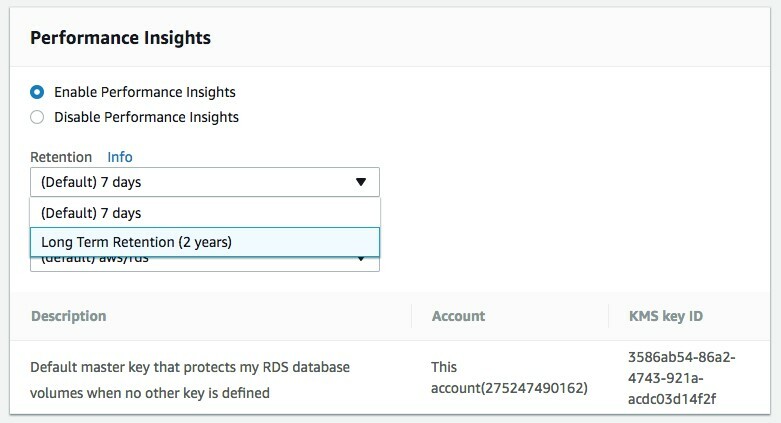 As of today, customers can also choose to retain up to two years of performance data history in Performance Insights. Turning on long-term retention is as easy as selecting it in the AWS Management Console, and only costs a small fraction of the instance price. When you turn on the long-term retention option, all performance data history is saved up to a limit of two years. With long-term data retention, you can view trend performance over time, analyze month-over-month activity, and compare end-of-quarter or end-of-year performance with earlier performance. You’ll find more information on pricing here. Today, we are also opening up public access to the Performance Insights API and SDK, allowing development of software that queries the performance data directly. Now you can load performance data into your own data stores or connect it directly into your in-house dashboards or third-party monitoring tools. Get more information on the API and SDK in the documentation. 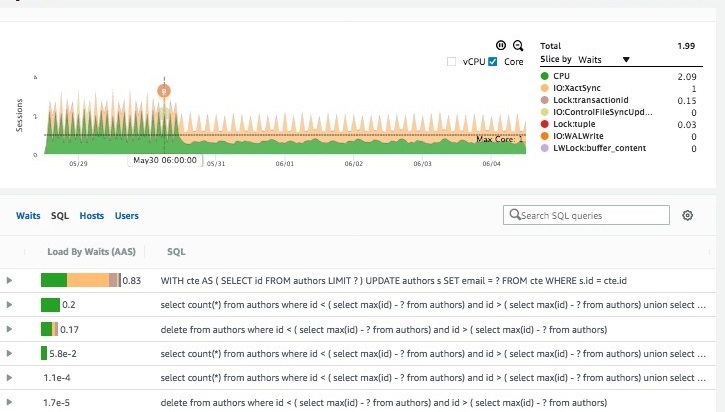 Performance Insights is providing you more than ever with today’s introduction of a public API and SDK, seven days of free-tier performance data history and optional affordable long-term history retention. Kyle Hailey is a product manager for Performance Insights at Amazon Web Services.